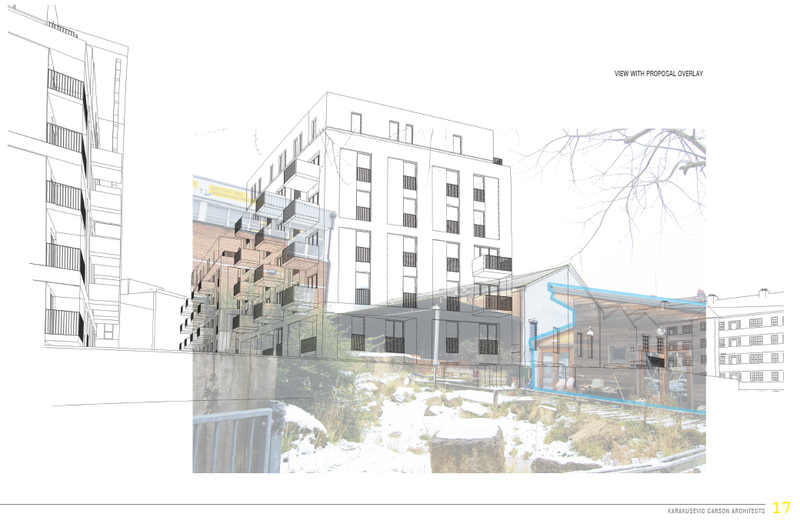 Faircharm update: Lewisham to approve planning application? 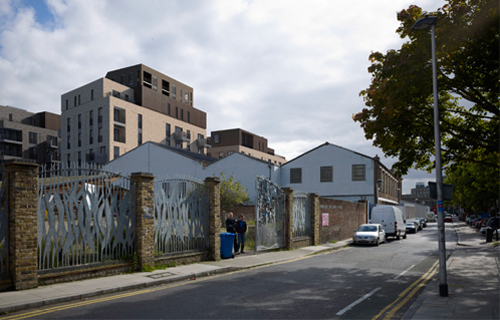 Lewisham Planning is recommending approval of Workspace's redevelopment plans at the Strategic Planning Committee meeting on Thursday 2nd May (7.30pm in the Civic Suite at Lewisham Town Hall). Those who have objected have been invited to attend (arrive at 7.15) to make further representation. This includes anyone who has signed the petition. Since the proposed development is not in accordance with THREE of Lewisham's own Core Planning Strategies, the application will then have to be referred to the Mayor of London (GLA) and then, possibly, to the Secretary of State. You can download the report that will be discussed here. (You may have to update your Acrobat Reader). The main recommendations are contained in Chapter 10. It would appear that many of the objections raised by locals and business tenants have been glossed over in favour of compromise. 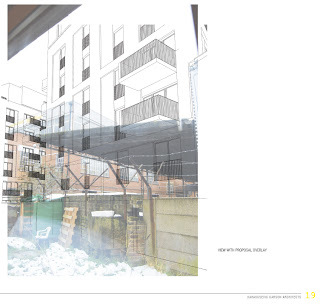 Lewisham want to keep Workspace in the area to continue their employment provision (Workspace threatened to close the site down), and they're not too concerned about only 15% affordable housing since they consider the residential component a 'windfall'. 55 written responses were received from local residents and organisations. In addition serious concerns were raised by Creekside Education Trust (who look after the biodiversity of the Creek and will be greatly overshadowed), Greenwich Conservation Group, the Amenities Societies Panel, and the London Wildlife Trust. GLA, TfL, the Environment Agency, Thames Water, English Heritage, the PLA and various departments within the Council were also consulted and advised. Greenwich Council stated the proposal contravenes Policies D25 and D26 of their Unitary Development Plan due to the 'excessive height' of the proposal and the detrimental impact it will have on the view from Point Hill. However, the potential loss of sunlight and overshadowing to Holden and Wilshaw is considered 'acceptable'. The impact on APT Studios was considered but dismissed because it is not residential (not like artists need light or anything!). Overshadowing of the Creek is also considered 'acceptable'. The poor parking provision onsite may result in a Controlled Parking Zone on Creekside. The Council identified far less kerb-side spaces available than the applicants claim, but still seriously overestimate (there are about 35 spaces on Creekside, the Council says 120!). Meanwhile, Creekside may get road humps to slow down lorries so that they don't kill any cyclists. The height of the tower and the adverse massing and density of the other buildings is considered 'acceptable'. The negative impact on the view of St Paul's Church was weighed up against the 'positive benefits of the development'. There's quite a lot of Section 106 money to come from this development. Money will go into rebuilding the Creek walls, to employment & training initiatives, education, health, open space, community facilities (Creekside Centre), town centre management (? ), tourism, transport (£430K), parking zoning etc. £100K will go to Lewisham Business Continuity Fund, to assist present tenants to relocate, and to finance the development of Faircharm as a future "micro-business cluster". The S106 also obliges the developer to use local labour during construction, and for them to complete the business spaces before any residential units are occupied. - a Construction Logistics Management Plan has been approved (to rationalise construction travel and traffic routes to and from the site, with detailed proposals for utilising the Creek for transportation of demolition and construction materials, restrictions on hours to avoid network peak hours, measures to deal with safe pedestrian and cycle movement). Meanwhile, present business tenants are not best pleased. They will have to relocate, never to return – because once settled in somewhere else they are hardly likely to want to upsticks and move back. Some are finding it difficult to locate large enough spaces elsewhere (Based Upon need 22,000 sqft and Wiramu & Schultz need 1000sqft for instance). They also question that the current buildings have outlived their usefulness, and point out there is a constant demand for industrial space in the borough. They believe Faircharm "could be full of successful businesses but for the uncertainties of tenure brought about by this application". 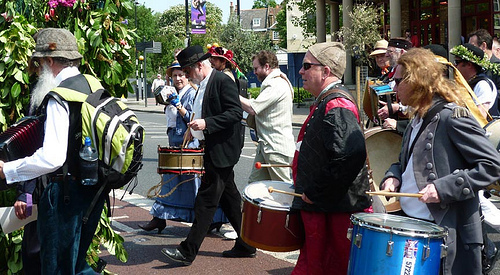 May Day is being celebrated by the Fowlers Troop and Deptford Jack in the Green with a procession from Deptford to Greenwich on the first day of May 2013. Unfortunately May 1st is not a bank holiday, but anyone who is free on Wednesday is welcome to join in this pagan celebration. Most of the route is on public streets, but between the Rose and Crown and the Star and Garter they will process through the Old Royal Naval College, and between the Plume of Feathers and the Richard I, they will process through Greenwich Park. 16.10 Ashburnham Arms, 25 Ashburnham Grove, Greenwich, London SE10 8UH. In case you didn't know, that's why you've got a day off next Monday, although the May bank holiday (which was only created in 1978 in the UK) was nearly abolished by the new Tory government in 2011 because May Day, traditionally celebrated on May 1st, is also Labour Day, or International Workers Day, celebrated all over the world, and in a great many countries is a day off work on the actual day, with major public festivals to celebrate workers' rights. 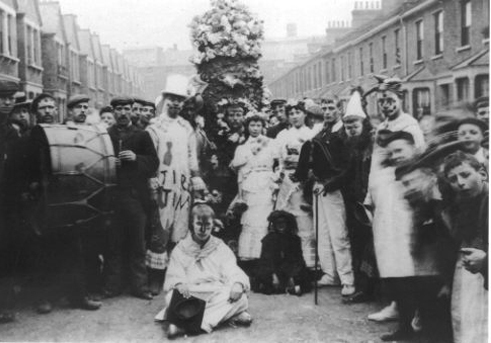 Many older readers will remember celebrating at school with a Maypole, Morris dancing and crowning a May Queen, as towns and villages all over the UK celebrated springtime fertility. May 1st is also the Feast of St Joseph the Worker, Catholic patron saint of workers, and a day off was given to farm labourers since seeding was usually done by this time. May Day is related to the Celtic festival of Beltain and the Germanic festival of Walpurgis Night. It falls exactly six months from November 1st, another day associated with European pagan festivals in the northern hemisphere. 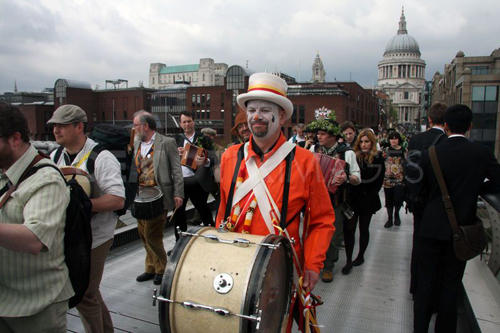 There are May Day festivities being held all around the country, though many are now scheduled to happen over the bank holiday than on the actual day. It's a very big deal in Rochester and Hastings when each town goes a bit bonkers from May 1st-6th. 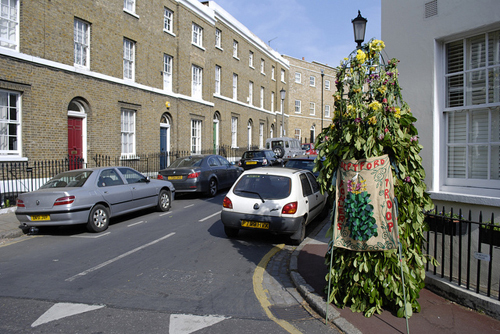 The nearest is Rochester which does the Jack-in-the-Green on Wednesday, then has the Sweeps Parade on Monday 6th. Council try before you buy bikes. There was a bit of a surprise in the Crosswhatfields? inbox yesterday. It came from the council and it was about bikes! For those keen to take up or do more cycling but are unsure if it is for them, they could try the cycle loan scheme. 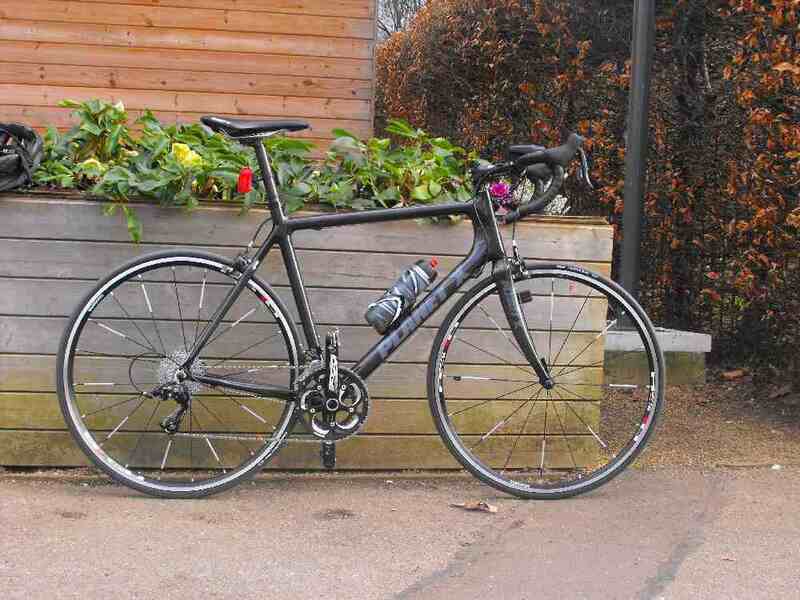 Anyone who lives, works or studies in Lewisham can borrow a bike for one month for £10 and use it for any/all their journeys. They will also be given a helmet, high-viz vest and lock and at the end of the month, they can either buy the bike at a reduced cost or return it. Cyclists from all over the borough are being encouraged to register for the Challenge. They will track their cycling for one month (May) using the web or their smartphone and the area or city that has the most mileage is the European winner! There is also the chance to win prizes at a local level for the cyclist who has done the most cycling for fun, for work or for journeys such as shopping, to and from school etc. And, while I'm on about bikes, Lewisham Cyclists, a part of LCC (London Cycling Campaign) organise a fair number of led rides. 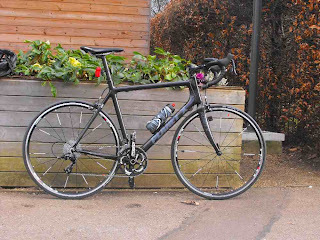 For example, there's a 25 mile ride around SE London's parks tomorrow, there are longer jaunts out into Kent as well as beginner-and-children friendly flat riverside rides. The application form submitted by Thames Water has been accepted by the planning inspectorate. Please see the Thames Water press release below. 1) Everyone needs to register to the planning inspectorate. You can do this online or by phone and post. You must do this by 28th May 2013. If you are wanting to register by post you have to start the process in time to receive the form and send it back before 28th May 2013. 4) Join our Facebook page at: https://www.facebook.com/DontDumpOnDeptfordsHeart I will be adding reminders of events and important campaign dates to this page. I will also try to email too of course! 5) Watch out for a public meeting of our own that we are organising – this will be in the next two or three weeks. Thames Water's sham of a consultation was just the end of the beginning. This is our real fight so please mobilise again and tell all your friends and neighbours to get behind this. 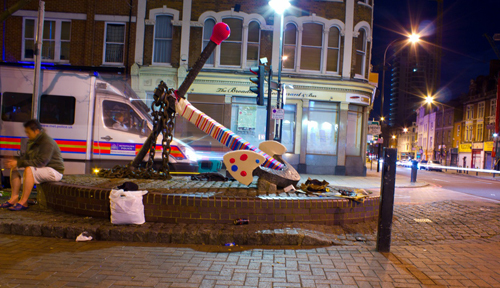 Update 26 April: see the Deptford Dame for later but more coherent posting. From today, (Wednesday 17 April 2013) members of the public are invited to register with the Planning Inspectorate and make a representation about the application for the Thames Tideway Tunnel proposal. The Planning Inspectorate accepted for examination, the application from Thames Water Utilities Ltd for Development Consent for the Thames Tideway Tunnel (‘Supersewer’) on 27 March. The public and those interested in the proposal can register with The Planning Inspectorate between 17 April 2013 and 28 May 2013. 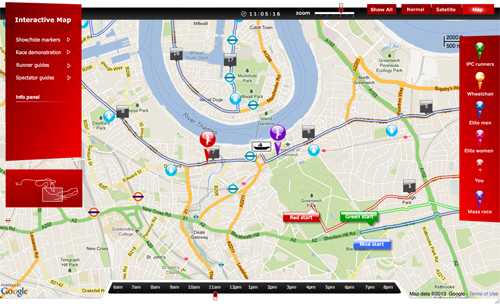 People can register easily online at: http://infrastructure.planningportal.gov.uk/projects/london/thames-tideway-tunnel/. Alternatively, they may call the Inspectorate’s helpline: 0303 444 5000 for a printed registration form, which must be completed and returned by 28 May 2013. Sir Michael Pitt, The Planning Inspectorate’s Chief Executive, said. “This is an opportunity for people to play a part in the planning process and influence the outcome. We encourage people to get involved by registering as an interested party. By doing so, people will be able to participate fully in the examination of this proposal”. Those who register will be entitled to provide evidence in writing to support their representation, to attend the Preliminary Meeting, to request an open floor hearing and to speak at other hearings where appropriate. To help people understand how the process works, Planning Inspectorate staff will be holding drop-in events and presentations in the local area to answer questions and explain how to register and make a representation about the application. The Inspectorate is not able to discuss the merits of the application at these events because this will be considered in due course by the appointed Examining Authority, at the examination. If you know someone who's running, it's quite feasible (we've done it) to cheer them on in Deptford, then jump on a train (if they're working) and cheer them again at another part of the course. More 2013 race information here (including details on road closures). Oh, and please wear red and hang a banner to save the NHS and Lewisham Hospital if you feel so inclined. It's a photo opportunity. 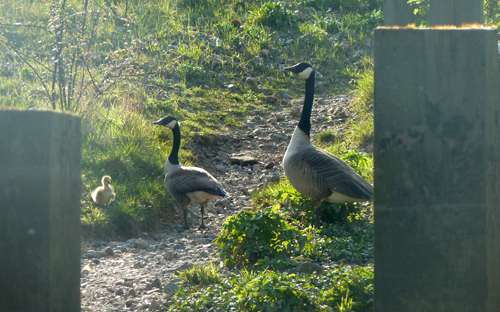 This pair of Canada geese have two goslings. Look out for them at the Ha'Penny Hatch. 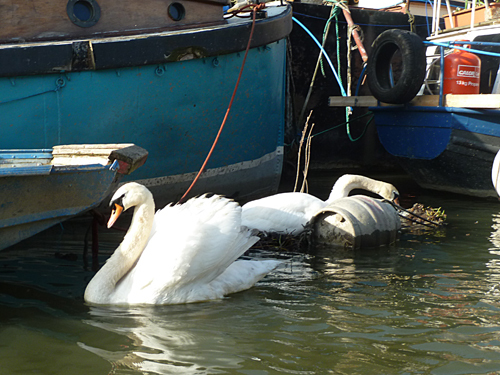 These swans have built a nest on a precarious floating garden next to the Theatre Arm boats. They have three eggs and the boaters are worried the eggs may not survive. 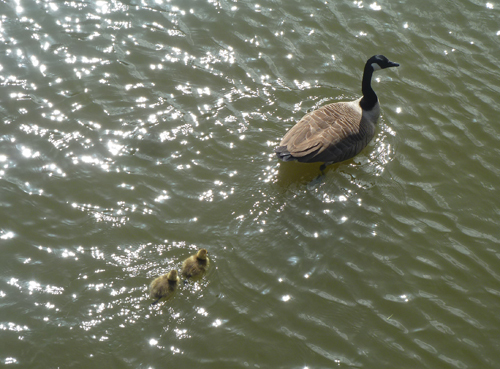 If they do, you'll soon be able to see the cygnets trying out the water from the Ha'Penny Hatch bridge. 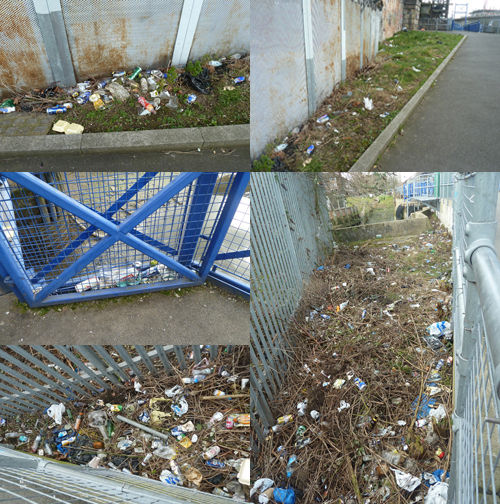 Back on 11th March, we reported the litter that had been building up on the grass verges either side of the Ha'Penny Hatch bridge. It wasn't easy since both borough's (Lewisham and Greenwich) online reporting tools would not recognise the existence of the Ha'Penny Hatch. The bridge does not have a postcode and the path does not have a name. However we sent photos and awaited acknowledgement. 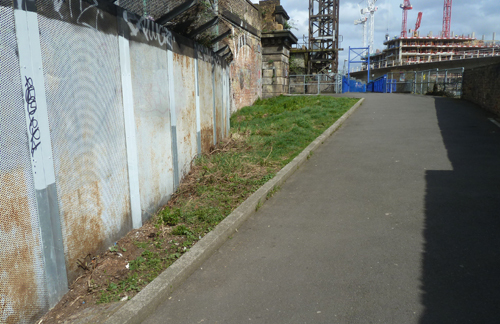 Greenwich responded on 22nd March saying our report had been passed to their Cleansweep service for action. We didn't hear from Lewisham until we sent the report again on 12th April, using a more direct method. 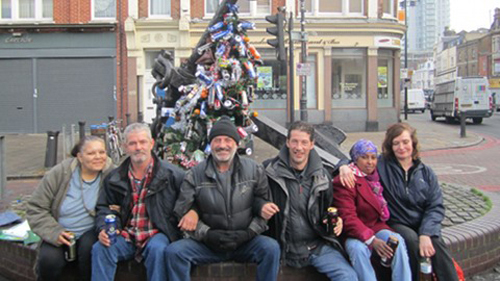 At first, Lewisham's Clean Streets team had no idea where the Ha'Penny Hatch was nor whether it was their responsibility, but the litter was then cleared the same day. But although Greenwich (who are responsible for the maintenance and operation of the bridge itself) had been the first to respond, they still haven't cleared the path on their side of the Creek. 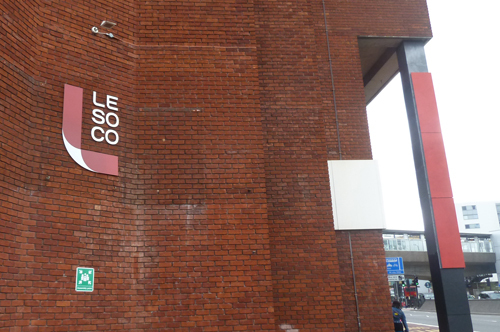 From green to red: Lewisham College has amalgamated with Southwark College to form LESOCO, with new logo and branding. From red to green: McDonnell's Racing has sold out to Paddy Power. 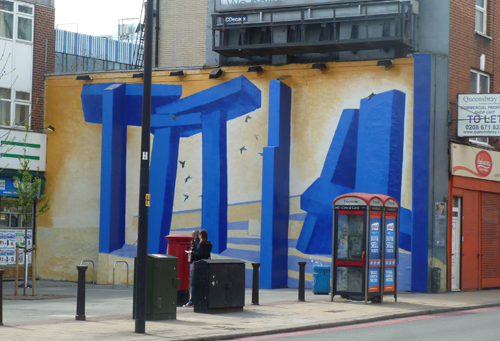 From grey to blue: Our least favourite ArtMongers mural has been given a make-over. "From a window of Daubeney Tower on Pepys Estate in 1981 you could see Rupert Murdoch's empire expanding in old Deptford. The 18th century storehouse, built around the original storehouse of Henry VIII's Deptford Dockyard, was being demolished to make way for more low-rise warehousing for Convoy's newsprint importers. In a glorious position on the old building, looking outwards to the river and inwards towards Deptford, was a clocktower. Known locally as Nelson's Clock, it had survived all the upheavals of the 19th century, remained a landmark of the Foreign Cattle Market, and even graced the road transport depot which had replaced the market by 1931. 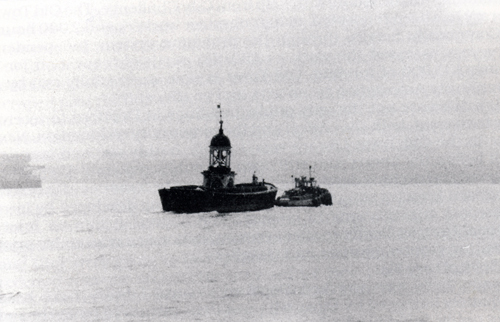 The clock cupola was saved from being pulverised, in the general demolition, by the GLC who had it removed first to Woolwich for repair, and then in September 1985 to the Ranger's House on Blackheath for £60,000-worth of restoration. Just a few weeks before the abolition of the GLC in April 1986, Deptford's clocktower was donated to what the Mercury optimistically labelled the "exciting town centre at the vibrant focal point of Thamesmead". The clock was described by a GLC spokesman as "a landmark for the people of Thamesmead to remember us by". He did not list the landmarks by which the people of Deptford would remember the GLC: Pepys, Trinity and Sayes Court Estates, the decaying Crossfield and the stolen Albury St cherubs. Instead, in response to the campaign by Rev Graham Corneck of St Nicholas' Church, and Deirdre Wood, GLC councillor for Greenwich, County Hall said: "Our plans to give the clock to Thamesmead went through several committee meetings and we heard of no objections. 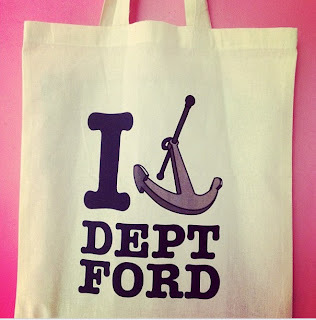 The people of Deptford did have their chance." If the people of Deptford were used to dealing with committee meetings and massive bureaucracies, we would have caused havoc in the planners' offices long ago. The clocktower in its Thamesmead location looks like any other shopping centre feature. It has no plaque saying where it comes from, no date to give shoppers an idea of their privilege; if asked most would probably say it was a reproduction. Deirdre Wood asked Ken Livingstone for an agreement that "if Deptford were in a position to put the clock back on one of its buildings, we would be able to have it back". Are we ready yet?" This was written in 1993. Twenty years later, on April 16th 2013, the "Deptford Anchor" went to Convoys Wharf to be stored. No one seems to know if it was ever part of Deptford, but a great many acknowledge its powerful symbolism. Will it stay there? 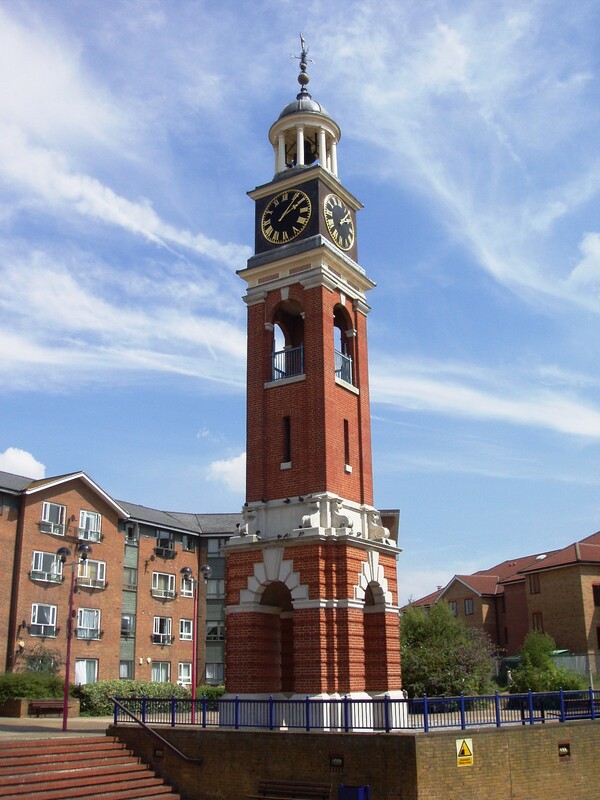 If we got the clocktower returned from Thamesmead, shouldn't it go to back to its original place in the Dockyard? Or perhaps both historic items could grace the brand new development at Convoys Wharf, to be dwarfed by 3,500 (mostly) luxury flats and three tower blocks (up to 42 storeys), in a "new town centre"? Or perhaps the clocktower could come back and be repositioned in place of the anchor, in the present town centre (actually not the original high street, which was in Church Street, how far do you want to go back in Deptford's staggered history? ), and be guarded in the same way the clocktower in Lewisham town centre is. Extract from pp 222 & 223 of Turning The Tide, A History of Everyday Deptford by Jess Steele, published by Deptford Forum Publishing, 1993. 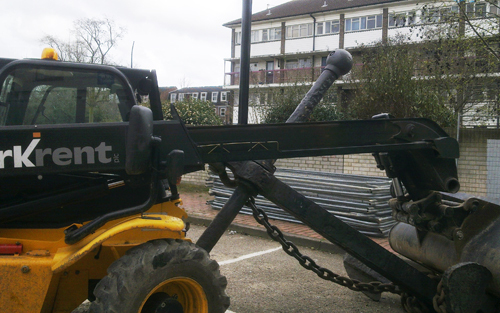 Update: We visited the compound this afternoon and found the anchor locked into a digger. A site foreman from Maylim (the contractor working on the high street) told us it will be moved to Convoys as soon as possible since although it is worth very little as scrap, they are concerned for its safety and the security of their compound. See our previous story on its removal. Also see the Deptford Dame. Plus, the Newshopper has a quote from a spokesman – "While a decision is made about the long-term location of the anchor, arrangements have been made for temporary storage at Convoys Wharf, this being one of the few places it can be stored due to its size and weight." Not so heavy that it couldn't be lifted by an ordinary JCB telehandler though! 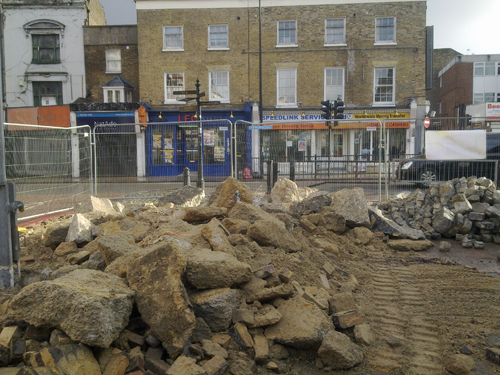 Meanwhile, see this post from Old Deptford History to see what used to be at the southern end of the high street...the remains of which are probably still there underground. 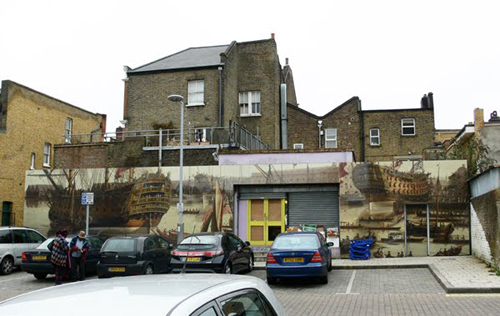 Apart from a blown up photo of a 1757 painting by John Cleverley the Elder on a wall behind the high street, only seen by those using Frankham Street carpark, the anchor at the top of Deptford High Street has been for the past 23 years the ONLY visible reminder in the town centre of Deptford's immensely rich maritime history. 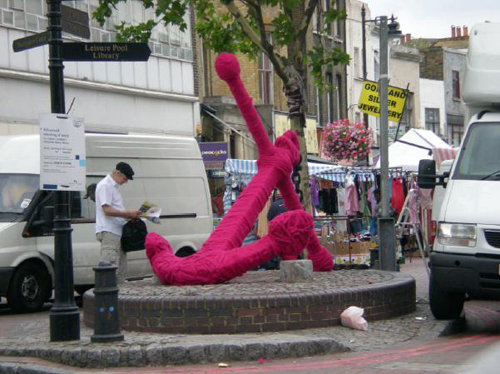 Originally located in Chatham Historic Dockyard, it was installed in 1990 when the high street was last given a makeover, and has become a famous and much loved symbolic landmark for many Deptford people. There would be no World Heritage site at Greenwich to speak of if it weren't for the shipbuilding and its attendant business that went on at Deptford since King Henry VIII established the King's Yard (now Convoys Wharf) exactly 500 years ago. In fact this year Deptford should be celebrating this history, not demolishing the last visible reminder of it – but it would seem Lewishame couldn't care less. 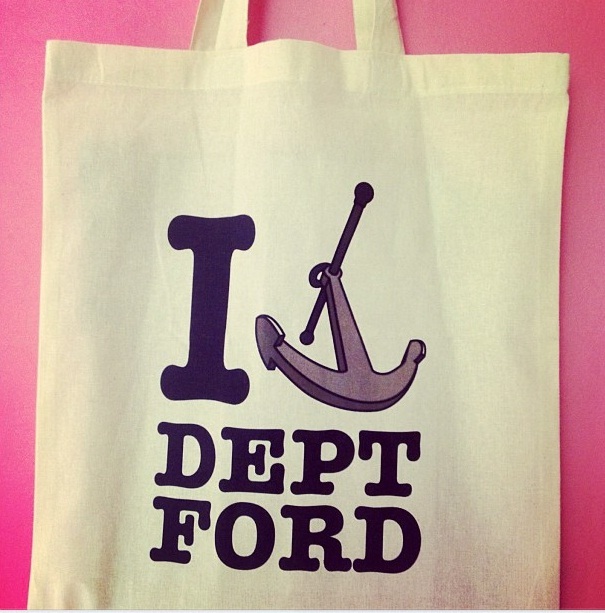 Even the National Maritime Museum cannot bear to acknowledge Deptford as its precurser. 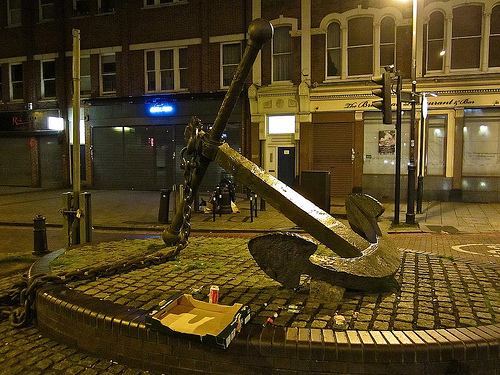 Unfortunately, the anchor has also been linked to the street drinkers who have long been drawn to it as a gathering place. It's not the anchor itself that drew the drinkers (not that they didn't love it as much as the rest of us), but the low wall the anchor was placed on – not only a convenient seating area within spitting distance of the shop selling 80p cans of Tenants Super but also in full view of drivers traversing the A2. A natural theatre for the dispossessed that perhaps made them feel real and visible (all too visible for residents and businesses next to the anchor), this was also the site of a public convenience many years ago that attracted a similar clientele. 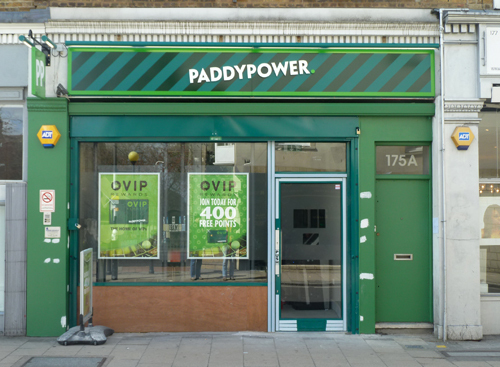 In the new £1.5m refurbishment that is taking place in the high street, the anchor was somehow considered part of a problem that perhaps has more to do with the proliferation of betting shops and the above mentioned historical precedent. Why not just get rid of the seating area if you want to make these people invisible? Lewisham did their usual sham consultation back in October, announcing they were moving the anchor, and asking locals "Where do you think it should go?" 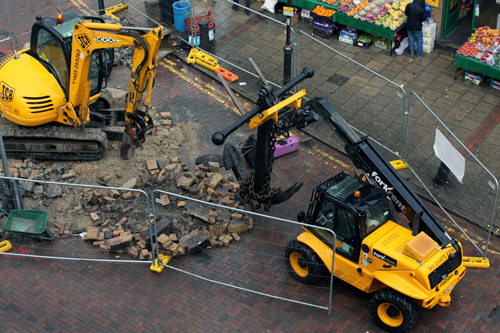 Lots of excuses have been made for why the anchor could not be situated elsewhere in the environs of the high street (apparently it's too heavy! ), and now it will go into "storage". Firstly we were told it would go back to Chatham Dockyard, but now we hear it will be stored at Convoys Wharf. Fencing went up around the anchor at the beginning of this week, and then today it was unceremoniously removed, leaving a pile of rubble and cobblestones. Of course, it'll be a while before Google update their Street View, so if you miss the anchor you can always find it on Google Maps (along with the less missed Peacocks!). 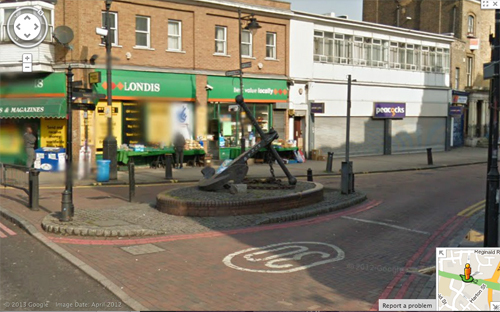 And here's the only town centre reminder left of Deptford's maritime past...(see our post from March 2010). Of course there are subtle reminders of Deptford's history everywhere in the form of place names and the like, if you choose to seek them out. Actually, there is one other historical seafaring reminder in the form of Mickhael Chemiakin's bizarre sculpture of Peter the Great that can be found down by the river at Millennium Quay. Perhaps the anchor may be seen again, with a similar backdrop of luxury housing, at Convoys Wharf? See Caroline's Miscellany for her post on Peter the Great – and also her post about the anchor and its symbolic connection to Deptford's links with industry and slavery. 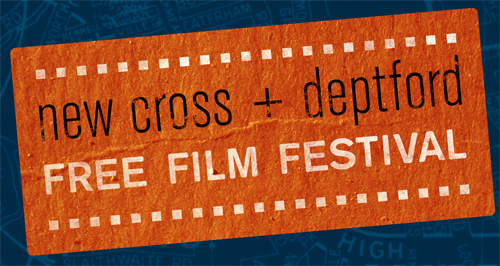 The 2013 New Cross & Deptford Free Film Festival runs from Friday 26 April to Sunday 5 May. The festival is planned and run by local volunteers, with free screenings at local venues. Check out the programme here. God forbid you should miss Thatcher's funeral on the telly next week (or the media's coverage of the celebratory parties and riots), but it's possible your viewing may be interrupted if you use Freeview. From 15 April there will be a test in south east London to help understand the extent to which 4G at 800 MHz may disrupt Freeview. Why should local residents care? 4G is the next generation of mobile telecommunications, which operators plan to roll out using the 800 MHz frequency this year. As 4G mobile services at 800 MHz and digital TV operate in adjacent parts of the radio spectrum, equipment that receives television signals, such as aerials, amplifiers, and digital tuners, can fail to block 4G at 800 MHz. This can cause loss of sound, blocky images or loss of some or all Freeview channels. The test is being run by at800, the organisation responsible for ensuring UK viewers continue to receive free-to-air television when 4G mobile services at 800 MHz are launched later this year. The test will encompass approximately 170,000 home and business addresses in south east London, across properties in the Boroughs of Greenwich, Lewisham, Southwark and Tower Hamlets. at800 is asking viewers in the area to report problems with television reception from Monday 15 April. Households and businesses that may be impacted will receive information through the post over the next few days. All you people (like us) who are too poor (or for whatever reason) to have Sky or Virgin can pop round to your Sky-fuelled neighbours to watch the funeral/riots if you're having problems! Make sure to report any problems you get though. 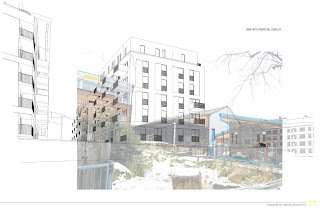 Additional documents have been submitted to Lewisham Planning by developers Workspace plc and their architects since the not-very-public meeting held at Creekside Centre on February 12th chaired by Dame Joan Ruddock (see previous post). There is still time to object to the application, and/or sign the petition. The petition has been handed in to Planning, but is still running. A recent deadline given for objections is April 17th "so that your views can be taken into account when the application is being considered", but as stated in previous posts, comments can be received up until some time in May. 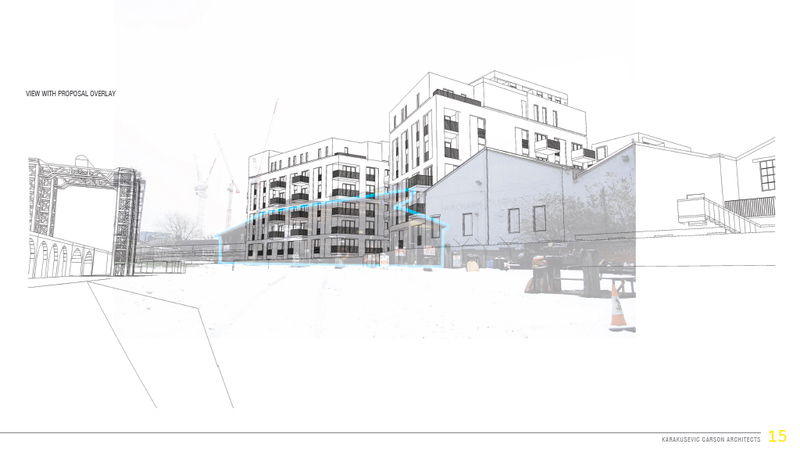 • No hope that the developers would look at the idea of using the Creek to transport materials in and out of the site: there will still be 180 lorries a day using Creekside during the three year construction period. This is by far the most annoying aspect of this development for locals, and if you have passed by the present construction on Norman Road, you will know how loud and noisy construction can be. Residents living next to the construction work going on at Paynes & Borthwick Wharf (down on Watergate Street) have endured endless disruption, with work going on six days a week, construction workers parking anywhere they like, a misuse of local green amenities, and concrete mixing lorries queueing up in the street from 6am, waiting to get on site. • The developers were asked to amend their figures on present traffic in Creekside since their study overestimated the number of vehicles using the road (290) in order to make the impact of their construction vehicles look minimal. It turned out their study had included cyclists! They still insist impact will be minimal, though worryingly their studies now show that the cumulative effect of all developments in the area will result in a 484% and 428% increase in traffic at the south and north ends of Creekside respectively by 2016. No evidence is provided as to which developments they are referring to, or how their own development might be identified within these figures. • Lewisham Planners questioned the information about queue lengths at junctions and impact on surrounding roads, and they think the applicant has underestimated the number of trips that will be made by businesses. The information on peak travel at junctions was underestimated, as was the impact on rail and bus services. The info supplied on large construction vehicles accessing the site was deemed inadequate and there were no details on how construction workers' parking would be controlled. It was noted that the 180 trips a day for construction vehicles does not include construction staff trips. 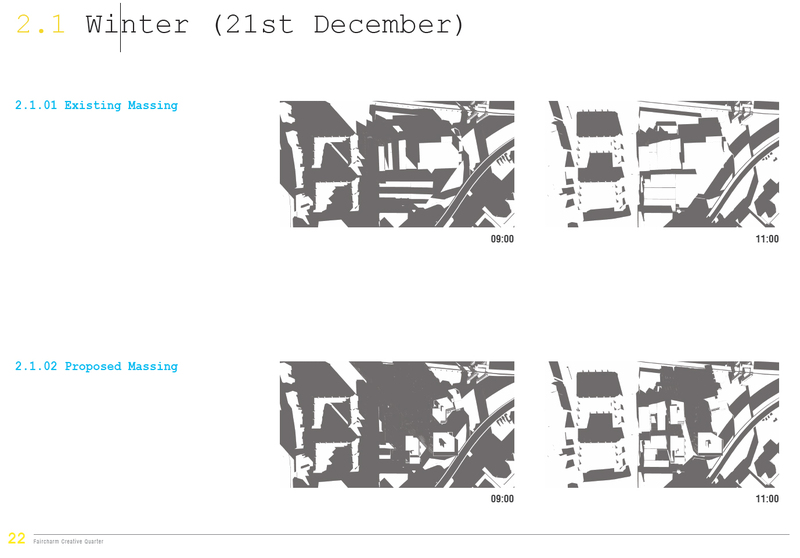 • LBL also challenged how Workspace has arrived at the figure of 300 employees working at the proposed development. In answer, Workspace said this figure was based on the Homes & Communities Agency Employment Density Guide for B1 Office Use. They said that in reality it was more likely that the site would have 80-100 employees. (Thus they cannot say they are increasing employment in the area!). However, newly submitted documents still insist there will be 300+ employees. • Some B2 use has been squeezed into the site at the Planner's request, but is still inadequate for the present tenants who need large spaces. In fact tenants have received NO CONTACT whatsoever since the public meeting on Feb 12th, with no attempts to find them alternative accommodation using the £500,000 Workspace claim to have put aside for this. 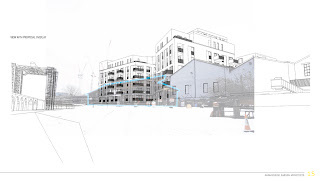 • Parking has not changed: the developer insists there will be enough roadside parking on Creekside (even though this only accounts for around 35 cars and is already fully occupied by other business users in Creekside) to make up for the paltry 28 parking spaces on site. 148 new flats = 246 new people + 300 employers/employees? • Of course, there is no change to the number of affordable units (15%). 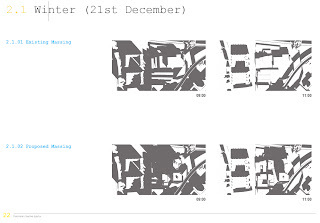 • They also still insist there will be minimal impact on sunlight to the surrounding buildings, and the submitted studies do indeed show little impact to Crossfields, but maximum impact on Creekside Centre and Deptford Creek (APT Studios are not shown). However, the studies do not show before 9am or after 5pm, and it is likely that there will be a huge impact on Crossfields before 9am in winter, when long shadows will be cast to the west. "Very much want to stay on Creekside as a tenant. We run the world's largest photography project from here and if Faircharm closes we will be forced out of the borough." "Workspace are capitalising on the developments taking place in the area with no consideration for the future of their tenants or their tenants businesses. Businesses here have worked hard to establish themselves; it’s critical now in particular, that all businesses can continue to develop without interruption. As with others here, TPG uses local resources and talent to support its operation – we have developed a network of support services from this area. If Workspace are successful in their application, the Faircharm redevelopment will be a dramatic loss to the local area and its employment. It’s not an acceptable route for this area when employment is tough to find and businesses need the support of their elected representatives to fight negative developments of this sort." "If the workspace plans for the Faircharm Estate are allowed to proceed the quality of life for local residents will be seriously effected and will destroy a thriving balance between housing and work that benefits all by offering a viable alternative to the over-bearing mainstream." "The proposed demolition (and building) work on the Faircharm will be intrusive, noisy, dusty and environmentally damaging. If the planned buildings were constructed it will compromise the security of, and access to, our site, largely exclude the local (Crossfields Estate) community, and merely create more under-sized flats in an area which is meant to offer employment opportunities." "Residents should be compensated for the inconvenience and disturbance caused by three years of construction works." "Redeveloping the site will force companies to move and take their workforce and clients with them away from Deptford. There is so much empty residential and commercial space around that increasing this instead of supporting creative industries does not make sense. People need places to make things, work together and build creative businesses and Faircharm has this." "Traffic disruption on a quiet back road, i.e. Creekside. Dirt and dust from the building site. Loss of light when tower is built. Parking problems. Negative effect on businesses already established on Faircharm. Rats and vermin." "Given the loss of industrial units in the area the last thing we need are more flats, the majority of which appear to be unoccupied as it is. Workshops and workplaces must balance the residential places in the area. Otherwise we are reduced to a dormitory suburb with high levels of commuting..."
"This development offers nothing to the community living and working on Creekside. The proposed buildings are architecturally ugly and obscenely expensive 'dormitories', with no sense of creating anything which, after years of disruption and mess, will enhance the area or build anything lasting for community use." "In an area that has lost nearly all of its dedicated work/light-medium industrial/artist studio space to high-rise, high priced residential units, it would be absolutely criminal to allow this profit-led development to go ahead." What are the rewards for Resident Involvement? Not a lot. Why bother to "get involved"? Why spend hours of your time in meetings to help those paid by Lewisham Homes to better understand residents' needs? Why join your TRA committee and work for free to help your fellow residents? It's mostly a thankless task with very few, if any, benefits – and isn't it always the same busy bodies who take on the same roles and responsibilities? As stated in the previous post, Lewisham Council (and Lewisham Homes for that matter) are keen to change the organisational structure of Lewisham Homes so that it can separate from the Council and become a 'resident-led' housing association able to borrow more money to do more stuff. Lewisham Homes would be different to other housing associations in that residents would have much stronger representation within the management. How this would work is still not entirely clear. Lewisham Homes already encourages community involvement and resident participation but there is very little take-up – despite training being offered for any Lewisham Homes resident to pick up admin and computer skills, and coaching available for those involved in their TRA committees (eg how to be a treasurer or chair). More incentives are required, instead of relying on residents' voluntary commitment. Even if participants take up the opportunities to increase their skills (and therefore employment opportunities), there's no guarantee they'll want to use those skills to contribute to the management of their homes. Lewisham Council is now taking part in the Time Credits scheme (see Lewisham Time Credits and also this post by Alternative SE4). This long-overdue scheme recognises the contributions of volunteers in the borough and offers them something in return. Time Credits are a 'community currency' that can be exchanged for free access to leisure services across the borough and beyond (including entry to the Tower of London, Millwall, the Albany etc) and services offered by local businesses. It was launched in February by Mayor Steve. The scheme is open to anyone taking part in volunteering activities in the borough. It is delivered by Spice Innovations, 'a social enterprise that develops agency timebanking systems for communities and public services that engage and empower the many rather than the few'. Spice says, "One of the challenges facing public and community services is that it is generally 'the usual suspects' that attend meetings, consultations, sit on all the steering groups....Citizen engagement is about moving beyond the 'usual suspects' and enabling a broader range of people to participate...By simply thanking people for their time in a meaningful way, local services will start to engage with many more." 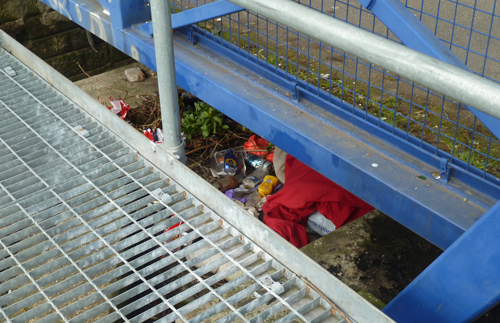 One of the areas Spice work in nationally is housing. The recent Crossfields TRA meeting about Housing Matters (see previous post) was attended by Lewisham Homes' Chief Executive, Head of Leasehold Services, and the person in charge of 'Housing Matters' at Lewisham Council – they had come to spread the word on the idea of a new "resident-led" Lewisham Homes. When a resident at the meeting brought up the idea of Time Credits in the context of incentivising resident involvement and making it worthwhile to get involved, not one of these people had heard of the scheme. More importantly, they did not know that the scheme is being piloted by Lewisham Homes' own Community Involvement Team in a trial with Honor Oak Tenants & Residents Association. According to Sue Asquith, Community Involvement Manager, it is going well, and the team are hoping to launch the scheme soon, to reward 'involved residents' across the borough. Watch this video to find out more about Lewisham Time Credits. Housing Matters was the main topic of discussion at the most recent Crossfields Tenants & Residents Association meeting. Clare Ryan (Lewisham Council) was joined by Lewisham Homes' Chief Executive Kevin Jones, and Head of Leasehold Services Sandy Canham, to explain the latest on Housing Matters and to tell the meeting how Lewisham was intending to consult residents over the coming year. We reported in January that the council has decided to press ahead with further consultation, having already conducted "a conversation about options" with us in the last couple of months of 2012. In that survey, many people were in favour of returning management of our housing to the council (the majority of respondents were elderly) and were not at all keen on being sold off to a housing association. People were also happy to keep everything as it is, which has been read as strong approval for Lewisham Homes. 1600 surveys were returned (around 10% of properties); it was decided that the survey results were not representative, so more consultation is required. It was also clear that no one really understood the implications of the council's favourite option: to turn Lewisham Homes into a "Resident-led housing association" that would be able to borrow the £85m required to build 250 new homes and invest in more improvements to current stock (and raise the Decent Homes standards above and beyond what they are currently able to do, including much needed external works). Presently, Lewisham Homes is part of the Council which is unable to borrow more than £44m. If Lewisham Homes became "an independent housing provider registered with the Homes & Communities Agency" it could borrow more money. (See previous posts or Lewisham's Housing Matters website page). This new round of consultation will consist of a team going out to talk to residents face-to-face (leaving out subletting leaseholders) with the aim of raising awareness and understanding of turning Lewisham Homes into a 'resident-led organisation' and of finding out what priorities residents have (a top priority so far has been pest control). The team will be door-knocking between 5pm-7pm on weekdays and 9.30am-1pm on Saturdays up until the end of May. If you're not in, they'll leave a card. Some people will be phoned, and different teams will be targeting street properties and sheltered housing. This time the consultation will be audited by independent tenant & leasehold advisors SOLON (not the housing association). They will be putting out information of their own, apparently. As a resident pointed out at the TRA meeting, people may get confused by phone calls from the Housing Matters team, when they are already expecting any call from the council to be from a MITIE surveyor ringing to discuss their new kitchen, bathroom and toilet requirements as part of the Decent Homes programme (see previous post). See also next post on Community Involvement. Towards the end of March, a couple of residents volunteered an hour of their time to walk around the estate with Peter Stunell, Transport Policy Officer at Lewisham Council, and Faye Martin, our new Tenancy Officer (standing in for Kerrie Taylor who is on maternity leave). Transport for London gave Lewisham Council some money to install bike racks around the borough this year, and as the tax year drew to a close, there was still some money left to spend, or some bike racks still to place. Crossfields was considered as one of the areas that might benefit. Although bike owners living on the upper floors on the estate would rather not leave their bikes in insecure locations at ground level, it was felt that more racks would be useful for visitors, or as temporary lock-ups. Around 45 locations around the estate were identified where there was space to install the new racks. Installation is scheduled to happen in May.